Supervisors and Employees can access TimeTrak in the Cloud, our On-Demand solution which provides all the power and benefits of our Enterprise solution without the headaches associated with licensed systems. Our cloud technology provides access to all TimeTrak modules, features and benefits. Customers eliminate the upfront purchase costs and IT infrastructure, all while speeding implementation and access to the benefits and savings. Employees can clock in/out and perform transfers to allocate their time to proper areas, and review personal information made available by corporate – time card, schedule, hours, benefit time, etc. Additionally, employees can request time off for review and final approval by their supervisor. Supervisors can easily review, edit and approve employee time, activities and payable hours for transmission to payroll. Supervisor dashboards update them on the current real time status of the employees they have responsibility for. Reports can be automated to be delivered at desired times, or run manually at any time. Eliminate the upfront purchase costs and IT infrastructure, all while speeding implementation and access to the benefits and savings. Now you can begin enjoying the full benefits of TimeTrak with minimal startup expenses and rapid implementation. Savings often occur within the first month of use. Use our Cloud Hosted Savings Calculator and see how much you can save today! Now you can begin enjoying the full benefits of TimeTrak with minimal startup expenses and rapid implementation. TimeTrak’s hosted solution permits you to outsource your Time & Attendance and Labor Management needs, permitting you to focus on your core business. You avoid the problems and expense of maintaining network infrastructure and the required IT support. Secure and redundant off-site servers host your TimeTrak software and data making them available 24/7/365. Free software upgrades are automatically administered. One monthly fee provides access to the vast benefits available from a TimeTrak system. The On-Demand “Pay as You Go” monthly program fee includes unlimited use of your TimeTrak software – no concurrent user restrictions, and no additional monthly charges for history, time card review, employee self-service module, or hundreds of existing payroll interfaces.. TimeTrak provides secure access to your software and data with state of the art encryption and firewall protection. Low Monthly Fee per Active Employee / Minimum $50.00 per Month (inactive employees’ data can be maintained in the system at no additional charge for accurate historical reporting, or even the return of an employee who can then be switched back to active status). Charge includes unlimited use of the software 24/7/365 and phone/web support during normal business hours. 24/7/365 support available at additional cost. One-Time Setup & Licensing Fee Dependent on Complexity of Payrules / Minimum $500 – charge includes licensing costs as well as setup of organization payrules and initial training. Further training, payrule fine tuning and adjustments are provided as part of the standard monthly program cost for software and support. TimeTrak In The Cloud program includes free use of the Web Time Clock, your on-screen time clock for employee punch in, punch out, transfers, and employee self-service. Should you desire to have a hardware clock for data collection the hardware clock program is detailed below. * – “limited vandalism coverage” includes non-abusive undisputed free replacement clocks. Charge covers the UPS ground shipping charge to the customer; the customer covers the shipping charge to return the defective clock to us. 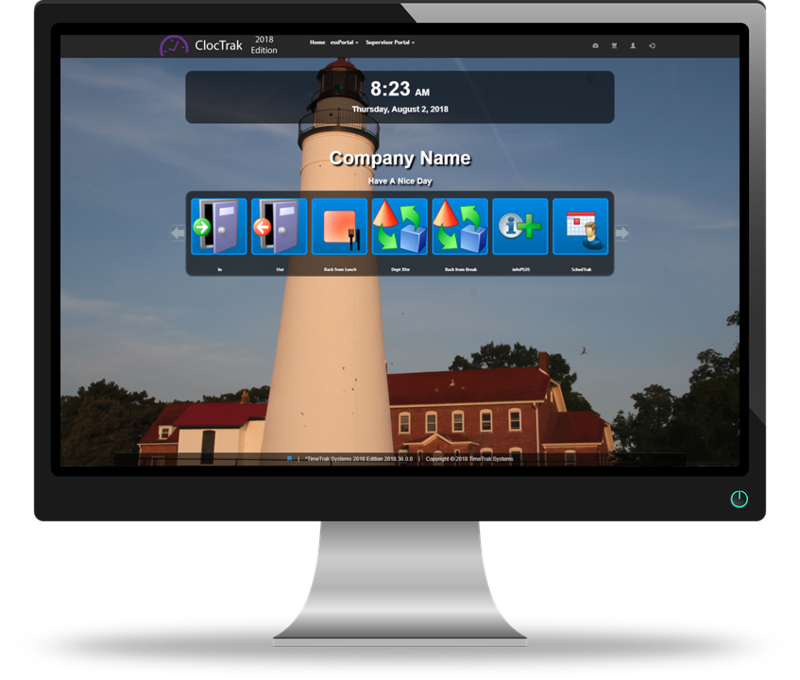 Upon a clock failure, customers can immediately begin using the free ClocTrak software clock on-screen for their employees to use for punching in and out until the replacement clock arrives. Customers can opt for faster shipping methods at additional expense. TimeTrak will configure the software options to meet your organization’s needs, and you can pick and mix any of the data collection options to supplement your solution. Cloud Hosted is a method of delivering business management solutions where the software vendor (TimeTrak) provides not only the business management solution but also the maintenance, daily technical operation, and support for the software provided. The software is installed and managed by a service provider (TimeTrak) via the internet as opposed to installed on your server(s).